CAN'T HANG has "It"-the indescribable quality that draws people in. 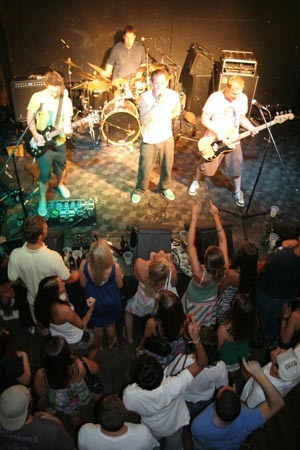 "It" could be the tight rhythm section, the booming bass, the unique punky-dub guitars, or the reggae infused songs, with their smooth, soulful vocals and catchy melodies. "It" could be Can't Hang's consistently amazing live shows or the magnetism of the members themselves. This band is overflowing with personality and talent. They have supported such nationally-recognized acts as Busta Rhymes, Toots and the Maytals, The Wailers, Steel Pulse, Pepper, Long Beach Short Bus, The Pietasters, Inner Circle, Yellowman, 2 Skinnee J's, The Expendables, Jimmies Chicken Shack, Authority Zero, The Toasters, The Slackers, John Brown's Body, State Radio and are always sharing the stage with their good friends Jah Works. The band is currently in regular rotation at Towson's 89.7 WTMD and was featured on the 98 Rock (97.9 Baltimore) Noise in the Basement Compilation CD. Also the band has been featured on 1057WHFS and DC101. CAN'T HANG has sold over 9,000 CD's without any label support, is touring nationally, and is eager to do whatever it takes to achieve even more recognition. IN RECENT NEWS-we have had two awesome drummers playing with us , sharing time for a while now. If you have not noticed or met them they are ALEX CROWLEY OF VOTE QUIMBY AND JEROME MAFFEO OF JIMMIES CHICKEN SHACK (check out their myspace pages). Needless to say they are both incredible drummers and have helped us through our rough and tough times. So next time you're at a show make sure you thank whoever is playing the drums that night cause without them we would not be able to do this!! !